Seven ringers (one more than expected): Jody, Jim, Judy, Ken, Marguerite, Rob, Thomas. We rang 1234568 (F-E-D-C-B♭-A-F). The front 6 had been raised before the wedding so we could launch straight into our best ringing. After the cue, Jim raised the tenor while the front six rang rounds—a surprisingly euphonious combination—and we then rang the 36 Changes with two covers. It was some of the best ringing the band has done recently. 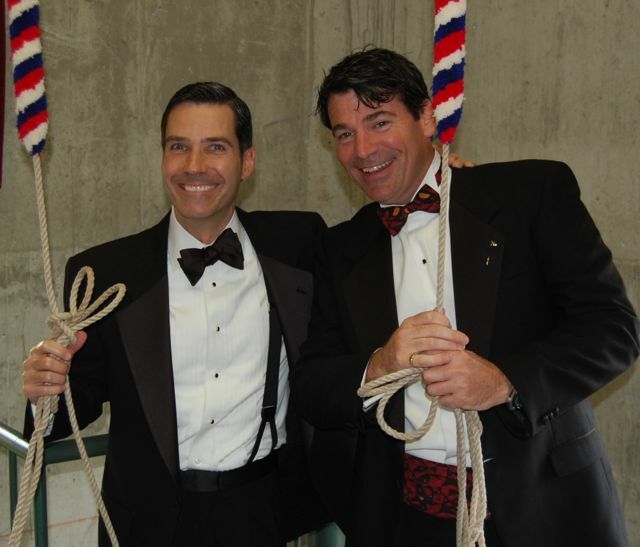 Two of the ringers were ushers for the wedding, and set a new, dashing standard for ringing attire! This morning when checking the tenor’s rope I noticed the tenor was striking twice for each stroke. When I lowered the bell and climbed up to look, I found its staple bolt nuts were not tight. The staple bolt could wander and turn while the tenor was ringing. I realigned the tenor’s clapper and tightened both nuts. I went round the ring checking the other staple bolts. Two more were loose (on the 2 and 7) so I tightened them. Remembering the weeks-long trial with the 5, I checked for rust on each bolt, and found plenty; several of the lock nuts were rusted in place severely enough that a struggle was needed to loosen them even with the long wrench. I took off each lock nut, wire-brushed the bolt’s threads clear of rust (down to the lower nut at least), wiped everything off, and worked molybdenum disulphide paste into the threads by back-and-forth spinning the nuts all the way down, to keep them from rusting solid over time. 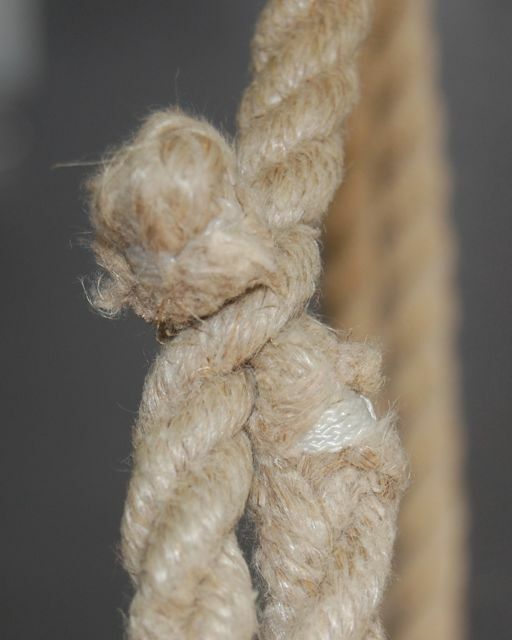 Most of the rope ends are wearing away to dust between the two seizings, with the 3’s and the tenor’s eroded down to less than half the original diameter. 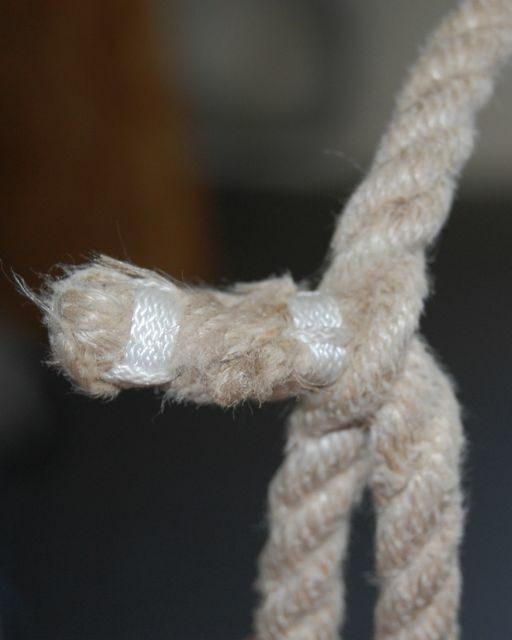 The tenor’s has been so weakened that I threw on a third seizing in case the end actually breaks off and the rope has to retucked immediately. 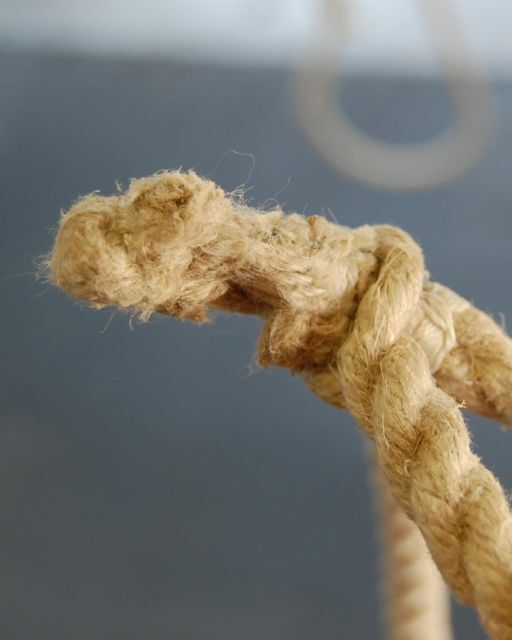 Ringers can help by not bending the ends back when raising, lowering, or ringing, and by not retucking any rope. 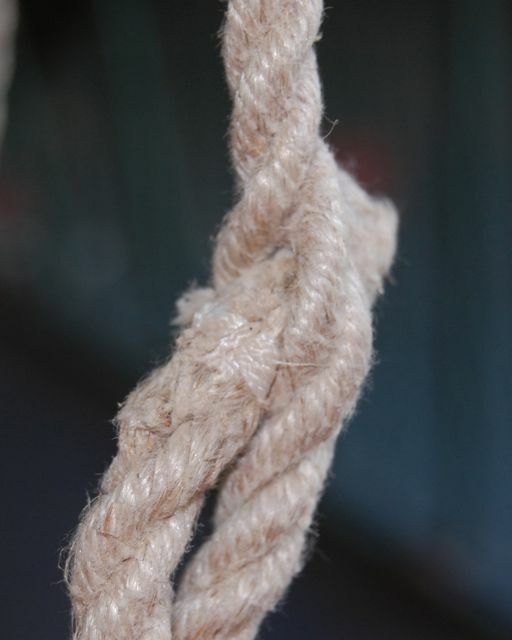 It’s not clear what should be done to deal with this; perhaps each rope can be given a third seizing, the original end cut off, and the new end retucked between the two remaining seizings. 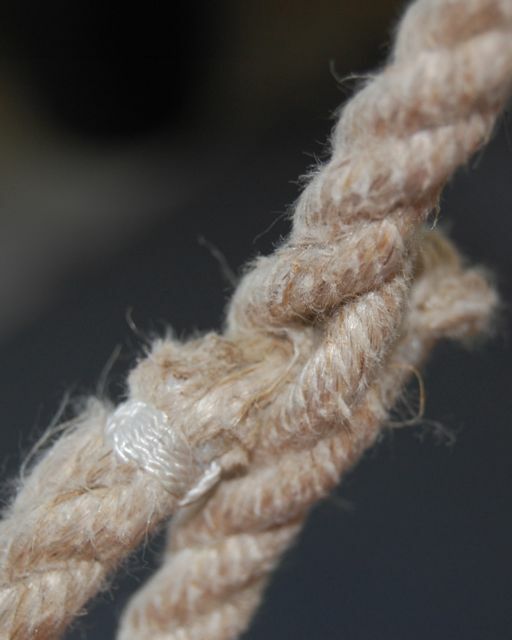 The original ends appear to have been finished with a crown knot, and the new ends can be finished the same way at the expense of a couple of inches of rope and new seizings. 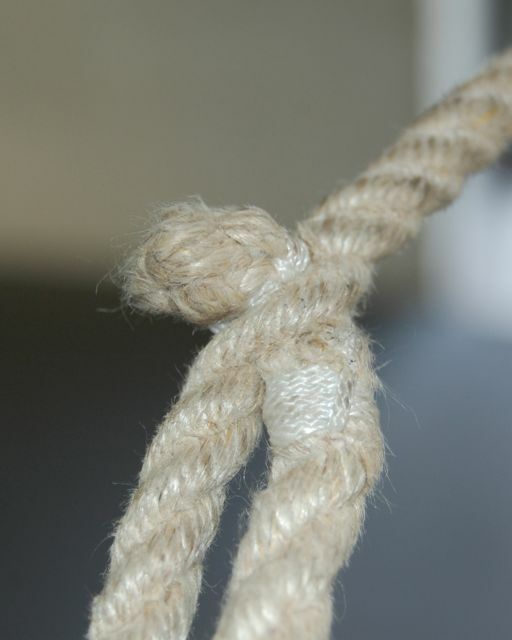 Is it time to order a new set of bellropes? The ropes of all eight bells have been adjusted to put the bottom of each sally ~65″ from the floor when set at hand, and the end of the tai ~76″ from the floor when set at back. Now none but our tallest ringers should need to take a knot, and our shortest ringers can reach all the sallies and all the tails. The 6’s sally is about an inch lower, and its tail an inch higher. The tenor’s tail is a full 10½” lower. 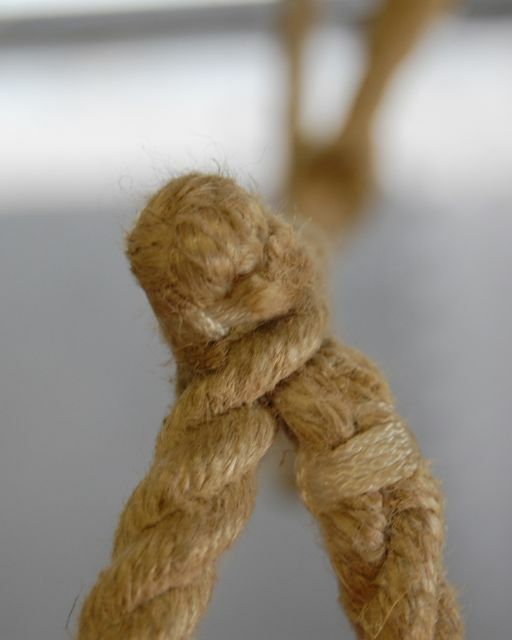 The tenor’s rope is taking longer to settle into its new position than the others. It will be readjusted over the next several weeks after it has settled and reliable measurements can be taken. Left wrist flick at bottom of handstroke. Vertical pull, no throwing out, good follow-through on both strokes, so the rope flows straight down and then straight back up again. All ten fingers around the rope and the sally. Strengthen the grip of all ten fingers by gripping a rolled towel as if it were a bell rope or sally, right hand over left, and squeezing. 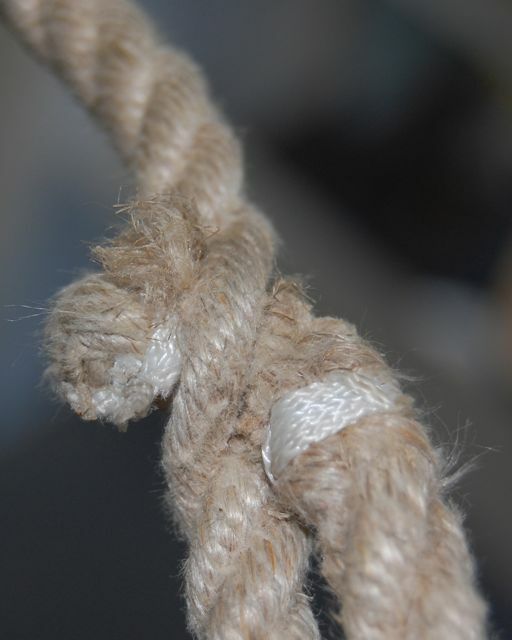 Practice aligning the left and right hands vertically as though the rope were stiff. Eoin’s forearm-rotation left wrist flick might work well for Carroll (see below); we’ll try it next time. Nineteenth class for new ringer Eoin. He rang the 4. Focus today was on cleaning up a few things that are blocking his progress. Main focus was on the bottom of the handstroke. Good progress on backstroke follow-through. He is now reliably flicking both wrists and pushing with his thumb. He is feeling the rope resisting his thumb push so his follow-through is fast enough. Left wrist flick at the bottom of the handstroke is improved but not completely reliable yet. He is now often sending the rope straight down to the floor, but wasn’t able to break his habit of reaching over his left hand to make the pickup on the far side. As a result the rope is going all over the place on the way back up, and his pickup is often delayed. He raised the 6 twice, to the point at which the first coil would be released, then lowered. Think about keeping his right hand on top of his left at the bottom of the handstroke, not over it on the left side. Practice crawling up and down the practice rope. Vertical pull, no throwing out. Don’t overdo the handstroke: release it before the sally pauses and shoots back up, and release with both hands at the same time and keep the right on the left down through the follow-through. Faster follow-through on the backstroke. She is flicking her wrists, but isn’t getting her hands down to the bottom of the stroke fast enough to feel the resistance to the push of her right thumb. She was able to set the 2 fairly reliably, making two handstroke sets in a row at one point. Next class for Barbara and Eoin is Su 1 Apr. Next class for Carroll and Nancy will be the week of 9 Apr on a day depending on Carroll’s schedule, possibly Tu before the regular ringing practice. At last night’s practice there was some discussion of what to do when things go wrong. We were ringing Call Changes and had just called the band into (for example) the row 54312 when things went bad very quickly, the 5 called out “I’m on the wrong stroke somehow, should I cut or hold up?”, and the band had to be called to stand. What happened? What should have happened? The 3, treble, and 2 followed the 4. The 5 realized something was wrong but didn’t know what, and within a couple of strokes it was no longer clear whether the 5 was half-a-stroke ahead or half-a-stroke behind. Of course we don’t know, and one can convincingly argue that it doesn’t matter or that both are correct; what mattered was that the band got so scrambled that we had to stand to restore order. We’re all in this together, and except when ringing specific exercises the overriding goal is to keep the band together and coordinated. The only time we “leave space” rather than following is when a new ringer is learning to ring in rounds; a new ringer is going to be striking blows all over the place so we ring steady and wait for them to get back in place. The 4 should have followed the 5’s lead; if that lead was clearly off, the 4 might have “averaged out” the error by striking somewhere between in-rhythm-with-the-earlier-blows and exactly-one-place–behind-the-5, but every ringer’s duty is to follow the bell in front and ring in the rhythm of the band. but the band would have been ringing as a unit. All it would take to straighten things out would be for the 5 to get back under control or the conductor to call “5 lead wider off the 2”. The right place is the one that keeps everyone together. Follow the bells in front of you as cleanly as you can, unless the conductor calls for you to do something else. Five ringers: Jody, Judy, Ken, Marguerite, Thomas. We rang 1-2-3-4-5. It had been so long since we had all seen each other that we talked a good bit and caught up on news. Practice usually ends at 7:30 but having spent so much time talking, and since the band was focused and enthusiastic and making good progress, we continued until 8:00. Rang up in peal, Thomas trebling. Long Places in 4-5, 3-4, 2-3. 36 Changes, in preparation for wedding ringing on Saturday. Rang down in peal, Marguerite trebling. After practice we looked at the Call Changes practice program http://www.thomasalspaugh.org/pub/crg/callChangesPractice.html.